This morning the Bishop of Huddersfield, Jonathan Gibbs came to the communion service before Lunch Club. 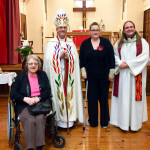 During the service, two of the regular members of the congregation were confirmed. 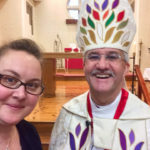 During the service Danielle told the congregation that this is the next stage of her journey after she came to the Pilgrim Course at the beginning of the year. As part of the service Bishop Jonathan prayed for the Holy Spirit to fill Beryl and Danielle. He then annointed them with oil. Afterwards, the community shared food together at the Over 50’s and Disabled Lunch Club. The Lunch Club is an important part of our community providing a place for people to eat together and form community in North Halifax. A huge congratulations to Beryl and Danielle! Bishop Jonathan will also be coming to Beer and Carols on the 19th of December at 7pm!